A New York researcher hopes that veterans of the current wars in Iraq and Afghanistan won't take decades to work through their Post-Traumatic Stress Disorder (PTSD) issues. 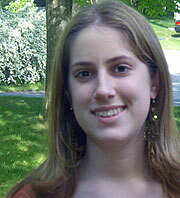 Maybe her youth as something to do with her impatience -- Ilana Rice is only 16. For the past year and a half, she's been studying how relationships can help heal PTSD. The high school junior hopes her study will help fill in the gaps in the research about the disease. Ilana Rice: Specifically, I'm looking at a partner's attachment style -- which basically means how an individual reacts in relationships. Desiree Cooper: So, what would be an example of that? Rice: So when you mix a veteran who desperately needs support, and you partner that with someone who is not willing to offer that support, it's detrimental to the veteran -- and that's what I'm examining. I think it's interesting the focus is on relationships and not on the individual, but more about how they relate within a relationship. I've realized that my research is probably more meaningful because it is sending the message when a veteran comes back from PTSD, it's essential you understand how you're receiving them, and what you are doing to help them -- or what you might be actually doing to hurt them. Ilana, why are you interested in PTSD? When I was younger, my mom is actually a VA psychologist. So that's why I've become so passionate about Post-Traumatic Stress Disorder in combat veterans. I used to send them Veteran Day cards every year, and some of them saw these cards and offered to meet me. And I've known some of them for many years and when I got older, someone of them shared their stories with me. Has your mom helped you at all with your research? My mom hasn't really been able to help me out that much because of her job. There are ethics issues with that, so I think the best thing she's done is be someone who can sympathize with how passionate I am about this research. And I think that's more valuable then just finding me a subject here or there. How hard has it been to find people to fill out the questionnaire? That has been the single most difficult part of this project. I think it's... a lot of it has to do with the fact that I am a high school student. My resources are not that extensive. I'm really working with a lot of local organizations when it comes to actually finding people. Originally I was looking only at the most current Iraq and Afghanistan veterans, and there are simply not enough of them to fill out a questionnaire so my study would be valid and that my data would be accepted. So I had to expand it to include Vietnam vets, veterans of the Korean War, Desert Storm, as well as the two most recent conflicts in Iraq and Afghanistan. And it's also very difficult to find people who have non-veteran romantic partners who are married to or living with them. Sometimes these partners don't want to fill out the survey. Ilana, what do you hope to accomplish with your research? Well, I think the -- probably the biggest benefit would be that my research somehow leads to the development of couple therapies in order to help prevent or treat Post-Traumatic Stress Disorder. Ilana, this has been wonderful. Good luck on your research. Thank you for allowing me on your show. If you are interested in participating in Ilana Rice's study, please click here to fill out our contact form. You can discover out many movers working in this particular position offer you top high quality and cost-effective shift companies. You have many helpful tips on this website. This is a well composed article that I have bookmarks for future reading. Have fun. post is very well written . thanks for taking your time to write this post .the topic is very nice . I am so proud of this young lady! As a wife and a mom of three service members, I think her research is much needed and I wish her the best! There are too many wives who just do not understand the consequences of going to war and what it can do to their husbands, and unfortunately in today's society, the "out" of divorce is too easy. The numbers of divorce rates are up in the military. Counseling is definitely needed for the spouse and I believe it should be government sponsored. How many wives know where to turn? Probably not many. Best wish Ilana - again, I am so proud of you! I am quite pleased to hear how Ms. Rice is researching a relational approach to dealing with combat-induced PTSD with veterans. I am a master's student at Appalachian State University who has started researching relational issues with combat-induced PTSD through various therapy techniques including Emotion Focused Therapy and Dialectical Behavioral Therapy. I would encourage Ms. Rice to look into these areas if interested & to consider marriage & family therapy in grad school if she is still interested years from now. Their approach relies heavily on the relational or systemic issues rather than the individual issues. Kudos to Ms. Rice and Weekend America! !